What’s more exciting than moving into your first apartment? Decorating it! Even if your new space is small, that doesn’t mean your style has to be. 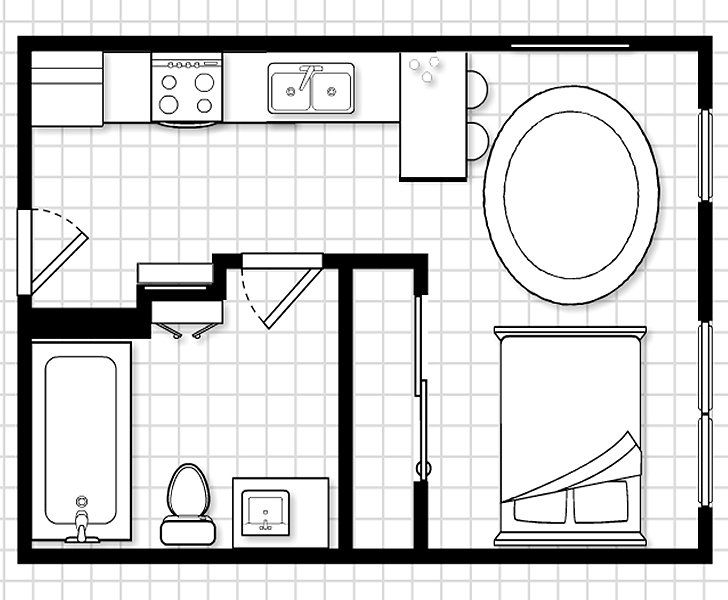 I’m moving into a 362-square-foot studio apartment and I have been running into quite a few walls, pun intended, trying to decide how to furnish it. My challenge: Create maximum flow to avoid actually running into walls while maintaining a modern style (and staying under budget). Being a minimalist, I am starting with just my wardrobe and a mattress. I will focus on furnishing the apartment to create an open feel, rather than utilizing every corner for storage. I am not purchasing anything until I move in (studio apartment rule number one). But, I have a splurge list of quality items and decorating tricks that will be great for this place and easily transition to my next apartment, no matter the size. 1. Raise eyebrows and micro-living standards with the Architecture bed. A splurge for a small budget, but my philosophy about studio apartments is: not every guest is going to expect to see a bed in the middle of your living room, so why not make it a really nice one? 2. Choose neutral artwork. My mother framed my baby pictures in Manhattan stainless steel frames over 15 years ago, and they will bring personality and memories to my entryway. 3. Accessorize. For the ultimate home decor accessory, the Lucent votive candle holders support the vertical aesthetic objective and will illuminate this relaxing and modern apartment every night. 4. A large mirror, like the Manhattan leaning mirror, gives the illusion of a larger space. Many restaurants use this technique to make their dining rooms look bigger than they are, creating a more relaxed environment for their patrons. Goodbye claustrophobia. 5. Hang a pendant. When you lack square footage, take advantage of high ceilings to draw the eye upwards. My favorite? The Glow pendant which will hang above my rug, so it is visible when you walk into the apartment. 6. To elongate the room, place a lengthy rug between the full-length mirror and bed. Luckily, I have hardwood floors, so a Cowhide rug in pepper will pull everything together, with the movement in the pattern continuing onto the mirror. Who doesn’t have an accumulating wish list while furnishing their home? I still have plenty of ideas and space in my micro-apartment for future items. I’m excited to invest in items that will last a lifetime and transform my tiny studio into a modern bachelorette pad. 7. With a monochromatic scheme, the piece Untitled 1 by Antje Hassinger will complement the rest of my modern space from above my bed. The placement will ensure that I can see it reflected in my Manhattan mirror every time I get into bed and wake up in the morning. What a view! 8. The Tori counter & bar stools in leather will match with the pepper cowhide rug in color and mirror in materials. Plus, they will tuck nicely under my bar counter. 9. The Addison bookcase in ebony will be a great storage addition in my bathroom for extra toiletries. A large bathroom is the best place to take advantage of storage space in a micro-apartment. 10. The Portica console table with a dark top will slip right under my Manhattan frame and serve as a great entryway spot to drop miscellaneous items. 11. If more seating is needed, the Sidney leather ottoman sits nicely at the end of any bed. Find more small space ideas and solutions in our inspiration gallery!